There is literally something for everyone in this year’s White Ribbon Day celebrations. From the main centres to the small towns, organisations throughout the country have arranged fantastic events to highlight the issue of violence against women and focus attention on the importance of talking to our children about respectful relationships and issues of consent. In Auckland you can start the day at the White Ribbon March (We Stand Because We Care) from Lower Queen Street to Meyers Park. 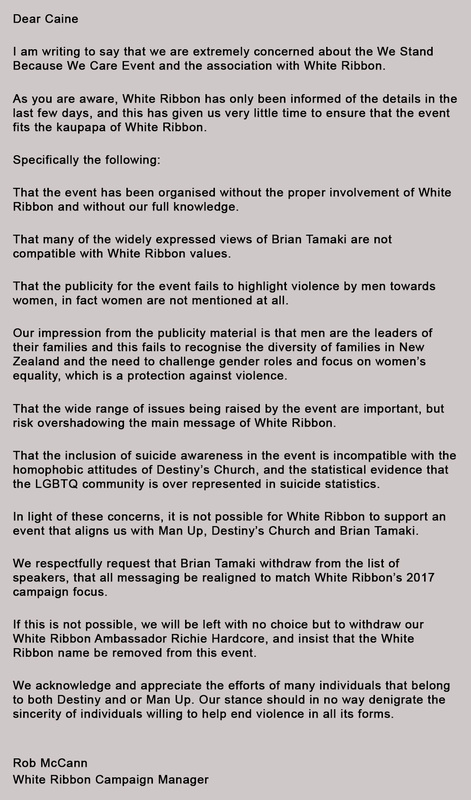 White Ribbon has withdrawn our support for the event and you can read why here). There will still be many supporters of the kaupapa present. Or if you prefer to hunt for a bargain, try the Counties Manukau White Ribbon Day Flea Market event in the Mangere Town Square from 9am to 12:30pm. There will be entertainment, agencies information stalls, spot prizes and another group of White Ribbon Riders. It is sure to be an informative and fun filled day for the family. Then head along to Sirens and Sounds Safety and Careers Festival in Eastdale Reserve in Avondale from 11am to 4pm, where emergency services have organised a community day, which supports White Ribbon. Or if you are in Rodney, come along to the Orewa Santa Parade with partner agency Abuse Prevention Services from 2-3pm. In Glen Eden from 5pm, join Raukura Aio “Building Respectful Relationships” at Hoani Waititi Marae for their annual open “mic” event with motivational speakers, entertainment, panel discussion and light refreshments. In Hamilton, check out the Touch Competition at Fairfield Park from 9am – 3pm. The White Ribbon campaign will combine with one of New Zealand’s most popular community sports at this family friendly event. The touch tournament will include speakers and music between matches, with 12 teams competing. Further south Porirua takes the lead organising a host of White Ribbon events for their community starting with Zonta Says NO” – White Ribbon Promotion by Zonta Club of Mana at Marina Espresso from 10 am to noon. The White Ribbon Ride is one of the most exciting initiatives tackling this country’s crippling domestic violence record. This week-long motorcycle tour happens every November as the riders spread the anti-violence message to school and community groups throughout New Zealand. The Billy Graham Youth Foundation is hosting a visit from the White Ribbon Riders at their Cannons Creek Boxing Academy. The Foundation has recently undertaken the new White Ribbon Workplace Accreditation programme. In Christchurch, head along to the Countdown on Church Corner opposite Bush Inn Mall where Amnesty International are operating a supermarket stall distributing white ribbons and collecting donations for Aviva (Christchurch’s family violence prevention service). Later in the day join the White Ribbon Riders as they share their stories and talk about the White Ribbon kaupapa at the Phillipstown Community Gala from noon to 3pm. The smaller centres are also well served with White Ribbon events. Throughout the Waikato you can purchase bunches of White Roses to show your support for White Ribbon with florists contributing on a much-needed donation to Women’s Refuge. If you enjoy a more active event, try the White Ribbon Around the Mountain Ride in Waitara, If you would like to be part of the ride, head down to Waitara Tavern for a 10:30am start. The entry fee is $5 which covers the cost of receiving a White Ribbon. In Kaikoura head down to the Treasure Hunt – Our Amazing Place. This amazing race-style community treasure hunt has been organised by Te Hao Matauranga Learning to raise funds for White Ribbon Day. It starts 9:30am at the Village Green. You can also take the pledge online and commit to standing up, speaking out and acting to prevent violence against women. Throughout the year make use of the White Ribbon Toolboxes that provide practical resources to help diminish and hopefully one day end the violence in our society. If fathers and other significant figures in boys’ lives commit to talking to them about respectful relationships and issues of consent we will be able to counter negative messaging they receive from other sources and give them the guidance they need to have happy and fulfilling relationships based on mutual respect.